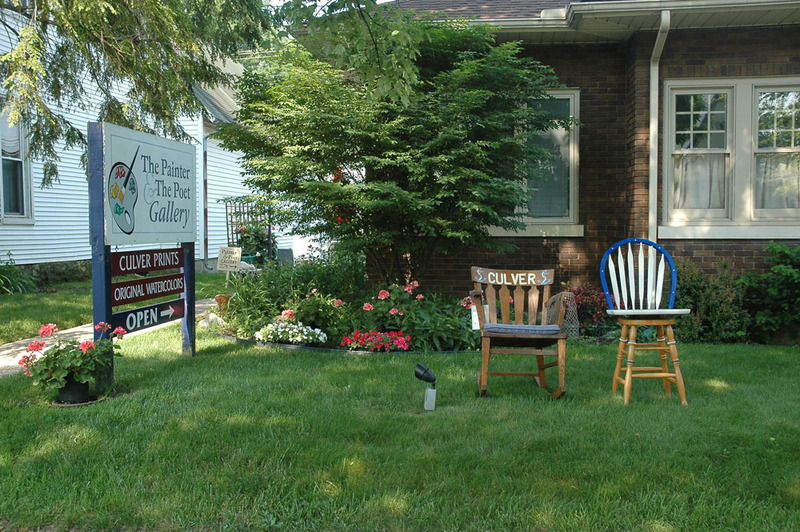 Painter and Poet's Front Yard with two "Chairs for Charity - 2011"
where any interested Culver resident can volunteer to paint (decorate) a chair of his or her choosing, and submit it to be auctioned to raise money for a variety of good causes. The auction is this coming Sunday evening, at Culver Academies Dining Hall, and this promises to be a lively enjoyable occasion. 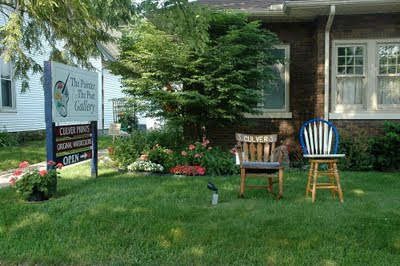 Since we are very visible on North Main Street, with a prominent front yard, we were asked to host two chairs. This was our pleasure, and Ward was glad to carry them in and out (depending on whether or not we were open and more importantly, whether or not it was raining.) I'm attaching a second "close up" photo. Note the bar stool on the right which features memorabilia about the Indianapolis COLTS football team, and the back of the stool is symbolic of a horse shoe. Very clever, Rhonda Anderson is the "chair artist" who thought of and created this stool. 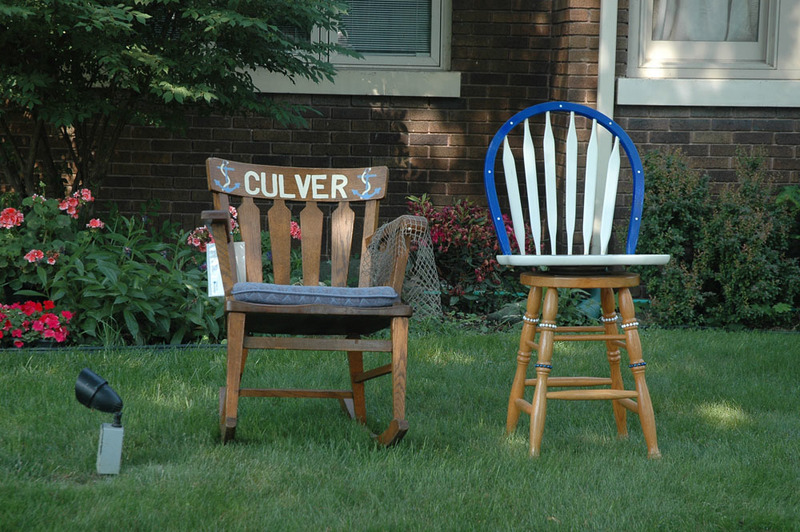 The other chair is a very attractive rocker, called ANCHORS AWAY, and decorated by Colleen Denham, who also happens to be president of Tri Kappa, the organization that sponsors this popular fundraiser. I thought each of these chairs terrific, and am sure the winning bidder of each will indeed be delighted. It's been a long time since I've posted a blog. Had a relapse of the dread shingles, but am now on a medication that is making it possible for me to get back into creating and doing. Very grateful for that. We are almost through with our final cookbook revision and will soon be posting details. In our last blog I wrote about our inclusion in Northern Indiana Art Earth Trail, with listings of over 150 studios, galleries, farmers markets, quaint lodging, & specialty shops across Northern Indiana. Go online ArtAndEarthTrail.com for easy details on inventory, open hours , locations, etc. There are seven loops in this routing map - each for a different county. Using this guide will help you map out your own trip in your own car - whenever you wish, and you can check out info on different possible stops. We are in the Marshall County tour, which is called "Time to Unwind". And our definite open hours are Fridays and Saturdays from 10 till 5, and also by chance, or appointment. Call us at 574-842-8888 if you want to come at another time, and we will try to be here for you. Let us know if you are on the tour, and we will be glad to invite you into part of our home to see some my watercolors in our private collection, and I will be happy to show you current "in the process" paintings - I usually work on several at a time. Remember, we have some originals and other items in our gallery, not available on our web site. Our web address is - www.painterandpoet.com We accept orders by phone or email (painterandpoet@sbcglobal.net) and you may pay by paypal, credit card, money order or personal check. Lots of rain here, and some severe storms, but the worst ones have skipped over or around us. Looking forward to writing more later. Labels: Our front yard with "Chairs"